He blames both parties for the shape America is in. He talks about increased security at the border with Mexico and has good things to say about the president’s trade policies. He believes there are drug cartel leaders who should get the death penalty. He thinks an assault weapon ban is taking things too far. He favors term limits. Oh, and another thing: He’s a Democrat. The 41-year-old state’s attorney and former Navy officer is at the forefront of a group of conservative and moderate Democrats the national party is counting on to help win back a majority in the House. Ask Democrats in Washington who they are most excited about, and he’s usually near the top of the list — he was asked three times in the past to run. “I’m not your cookie-cutter Democrat, that’s for sure,” Kelly is fond of saying. As for the “moderate” label, he rejects it — but mostly for style purposes, it seems. “I’m not going to be moderate in my approach,” he said. “I don’t think it’s moderate to want to fight like hell for the future of our democracy.” Indeed, he won’t be voting for Minority Leader Nancy Pelosi should Democrats regain control of the House, saying it’s time for a change (though he did attend a recent fundraiser Pelosi headlined in D.C. for Illinois Democrats). If he wins his election in the 12th District against second-term GOP Rep. Mike Bost — an election that prognosticators in the past few months have been inching into more favorable territory for Democrats — he’ll also bolster the ranks of a once-storied group of conservative Democrats that has since fallen on hard times: the Blue Dogs. They’ll need all the help they can get. At the height of their powers, in 2009, the Blue Dog Coalition boasted 54 members — 21 percent of the entire Democratic caucus. The group of conservative Democrats was formed in 1995 because its members believed that they had been “choked blue” by the extremes in both parties. The last time Democrats had unified control of government, in 2009-10, the group shaped negotiations over the stimulus bill, cap-and-trade and the Affordable Care Act, oftentimes withholding support in exchange for concessions. Unsurprisingly, this angered the liberal wing of the party. Their ability to influence anything has likewise evaporated. Most of the policy proposals they have endorsed this year, like a balanced-budget amendment, have been ignored by both parties. And even when members reached out to Republicans last year on the tax bill, they got the stiff-arm. Yet many are now eyeing 2018 as the Blue Dog’s comeback tour, its path back to relevance. In 2017, the group hired a full-time communications director for the first time since 2014. The Democratic Congressional Campaign Committee has teamed up with the Blue Dogs to identify candidates in districts where Trump prevailed. They are quick to point out that of the six seats Democrats picked up in 2016, four of them are current Blue Dogs. So far, the Blue Dog PAC has endorsed 14 candidates for 2018 (though some have already lost), and more endorsements are on the way, members of the group said. In March, one of their members, Illinois’ Daniel Lipinski, turned back a determined challenge from a more liberal opponent, Marie Newman. Conor Lamb, who stunned everyone in March with his special election win in Pennsylvania, is the newest member of the group. Many candidates now are starting to emulate his campaign: pro-union, Trump-curious, anti-Pelosi. The group hit a bump in the road May 15, when former Rep. Brad Ashford of Nebraska, who got the Blue Dog PAC endorsement in his race to reclaim a seat he lost in 2016 to GOP Rep. Don Bacon, came up short in a primary to Kara Eastman, a social worker with a significantly more liberal profile. On that same day, moderates in Pennsylvania fell to more liberal challengers. Still, the group is now starting to think big. Jim Costa, the California Democrat who co-chairs the group, has no doubt there will be growth in the ranks. If that were the case, the Blue Dogs would once again be players at the table. “If they were to be a caucus of 30 members and they were able to institute rules like the Freedom Caucus” — the far-right group in which members vote as a bloc on legislation — “they could have leverage,” said Danielle M. Thomsen, a professor at Syracuse University who has studied the decline of moderate candidates for Congress. As the group plotted its comeback last year, it tapped a moderate diaspora that is now sprinkled throughout D.C.
Kristen Hawn, who once worked as communications director for the group on Capitol Hill, said that since the 2010 wipeout, the Blue Dog mafia, as she and others have been calling it, has kept in close contact. “We’re a tightly knit group of people. Not just colleagues, but close friends,” she said. The group she co-founded after she left the Blue Dogs, Granite Integrated Strategies, is helping train moderate candidates on messaging, issues and interacting with the media. The Blue Dog PAC, which has raised nearly $1 million so far this cycle, is poised to exceed its fundraising efforts from 2014 though will likely fall short of 2012, when it raised $1.8 million. The PAC “double maxes out” — meaning candidates receive $5,000 in the primary and another $5,000 in the general election. Many contributors who have hit their contribution limit to the PAC have been steered to individual candidates, Hawn said. And even though many Blue Dogs are staunch defenders of gun rights, the group did run into some rough waters when the McClatchy news organization discovered in April the PAC had accepted $9,950 from the National Rifle Association. While the PAC had accepted NRA money in the past, Hawn said that following an objection from Rep. Stephanie Murphy, a Florida Democrat and a Blue Dog, the money from 2017 was returned and the 2018 money was refused. Going forward, the PAC won’t accept NRA money, she said. The co-chairs of the PAC, Reps. Kyrsten Sinema of Arizona and Kurt Schrader of Oregon, screen potential candidates, asking open-ended questions on fiscal issues and national defense, the group’s top two priorities. The candidates get questions about the size of the national debt and whether they think it’s bad that China is holding so much of it. Schrader said he’s been telling candidates that in his recruitment pitch there will be opportunities to work with Republicans on “meat and potatoes issues,” no matter the outcome in November. He cites some of the regulatory rollback that’s been happening using the Congressional Review Act as an example — many moderates and Blue Dogs have joined Republicans in supporting resolutions striking down Obama-era regulations, including one that prohibited mentally impaired Social Security recipients from purchasing firearms. In the meantime, Blue Dogs are eyeing candidates for potential future endorsements. Let’s say Blue Dogs deliver in a big way in 2018. What will they do with that newfound power? That is not entirely clear. One scenario that seems most likely: Democrats take control of the House, the Senate retains its narrow Republican majority and Trump is still in the White House. What legislation could get passed? Molly Reynolds, who studies Congress at the Brookings Institution, thinks infrastructure would be a likely candidate for action. She also thinks there’s an appetite for overhauling the appropriations process. “That’s another place where there is bipartisan support for reform,” she said. One option that could be on the table is bloc voting. Blue Dogs could follow the lead of the House Freedom Caucus. In that group, if 80 percent of the members take a stand on an issue or legislation, the rest of the group must endorse it. Peterson, the Minnesota Blue Dog, said he’d be open to the idea. “It’s something to be considered,” he said. “On certain bills or certain times.” Most others in the group, though, are not terribly enthusiastic about it. “We’ve resisted that in the past,” said Costa, who thinks the group can use its leverage in other ways. While Blue Dogs say candidates have been plentiful this year, Thomsen’s research suggests this might be a momentary blip. 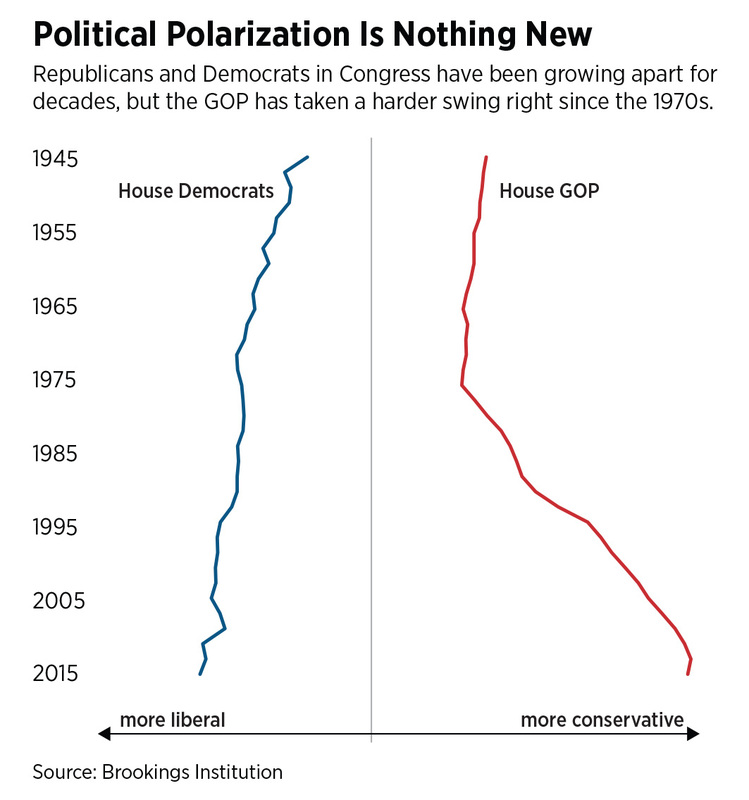 Since 1980 there has been a dramatic decline in the number of moderate Democrats running for Congress. Her research, which defines moderates as those at least as conservative as former Rep. John Tanner of Tennessee (a Blue Dog co-founder), shows a decline from a high of more than 20 percent in 1980 of the total pool to only 3 percent in 2014. This year, according to recent data compiled by The Washington Post, the number of liberal candidates running for Congress is at its highest level in decades. Thomsen thinks today’s moderates — who are much more liberal than their forebears from 10 to 20 years ago — are simply forestalling the inevitable, that eventually most all of their kind will be wiped out. Reynolds agrees. “I don’t necessarily see a really large-scale change where all the sudden we see a huge centrist bloc of moderates,” she said. It may be a bigger tent, but the group clashed with the DCCC earlier this year, when New Mexico Rep. Ben Ray Luján, the chairman of the DCCC, declined to provide a specific endorsement for Lipinski, an anti-abortion Democrat from Chicago, in his election win over Newman, a liberal candidate backed by Illinois Reps. Jan Schakowsky and Luis V. Gutiérrez. After an outcry from moderates, the DCCC reversed course and endorsed him. Lipinski said he isn’t interested in rehashing the fight, but is gratified that he won, all but assuring an eighth term in his Chicago-area district. “I’m not looking back at this point,” he said, allowing there have been some “rough patches” with party leaders. “Democrats can’t have these fights within the party when you’re trying to regain the majority,” he said. To that point, Schrader said he and many in the group were upset with the DCCC and are now advocating for changes to ensure that incumbent candidates get the group’s explicit backing. The abortion issue has riled the Democratic Party — most notably in Lipinski’s race. Lipinski is one of the few remaining abortion foes in the party, and pro-choice groups led by NARAL spent $1.6 million to defeat him. Democratic leaders have reiterated time and again that they would not use a candidate’s position on abortion as a litmus test. In Utah, the issue has come into play, but this time as an attack from the right against a candidate Democrats are excited about. Ben McAdams, the mayor of Salt Lake County, who considers himself a “pragmatist,” will likely face Mia Love, the first African-American woman elected as a Republican to Congress. He’s received the Blue Dogs’ endorsement. For the most part, Blue Dog candidates are not facing many significant primary threats from the left, but where they have, it’s been rough going. Three prominent, Blue Dog-backed candidates who many in the party saw as keys to retaking Republican-held districts have fallen this spring. In Texas, Jay Hulings outspent his opponents after being showered with $64,000 from establishment-backed committees, but still finished fourth in a bid to unseat GOP Rep. Will Hurd, considered one of the most vulnerable Republicans in Congress. Instead, the candidate in that district is Gina Ortiz Jones, an openly gay Air Force veteran. In Virginia, Roger Dean Huffstetler outspent his opponents, but his campaign never seemed to catch on. Indeed, the PAC associated with the Blue Dogs donated $3,500 to Huffstetler — $1,500 below what the group typically gives to endorsed candidates in their primary. National Democrats have poured their effort into recruiting and running centrists in an all-of-the-above strategy, sometimes working to shove progressives to the side during primary season out of a fear that such candidates would get wiped out in a general election — most prominently in a Texas district with candidate Laura Moser. That wasn’t the case in Virginia’s 5th District, a massive, 10,000-square-mile area that stretches from the Washington suburbs to the North Carolina border, and includes the city of Charlottesville. In that race, Huffstetler squared off with Leslie Cockburn, a former journalist. Huffstetler checked all the boxes for this year’s strategy — former military, entrepreneur, former chief of staff to Democratic Rep. Seth Moulton of Massachusetts, who has been recruiting veteran candidates. He outraised Cockburn by over $400,000, and seemed primed to challenge first-term GOP Rep. Tom Garrett, a member of the House Freedom Caucus who won his race in 2016 by 17 points, but whose fundraising has been weak. But Cockburn, who supports Medicare for all, an assault weapon ban and repealing the tax cut bill that passed in December, said she never felt any pressure to drop out. “They have not caused us any problems,” she said of the DCCC. “They’re being extremely helpful right now.” She defeated Huffstetler convincingly, not in a primary election, but rather in a caucus convention held earlier this month. Still, some of her stances and history could cause unease for those eyeing the district for a takeover — and the DCCC has put the race as a target for pickup. Some Democrats fear that advocating Medicare for all will expose candidates to GOP attacks in the fall. “It would be a massive tax increase; it would make your individual plan illegal,” said one Democratic strategist not involved in the race. And in a March interview with a local radio station in Charlottesville, she compared recent actions by Immigration and Customs Enforcement to Nazi Germany’s secret police. “We don’t like the fact that ICE is like our new Gestapo,” she said. When asked about this comment, Cockburn did not disavow it and explained that she was talking about aggressive enforcement actions such as roadblocks and checkpoints that she felt went too far. “That kind of effort … is very unfortunate and I would not support that type of operation,” she said. Brendan Kelly, the Illinois Democrat, said he’s tired of the labels being placed on candidates — “I think these ‘You’re on the right, you’re on the left or you’re a centrist’ — I think that’s garbage, too,” he said. After all, in addition to his conservative leanings on a number of issues, he is still a supporter of abortion rights, believes in stricter background checks for gun owners and, most recently, has come out with a decidedly left-wing proposal in support of the rescheduling of marijuana, which could smooth the way for legalization efforts (though he thinks recreational use should be left up to the states). Kelly believes that prescription marijuana could ultimately replace opioids.